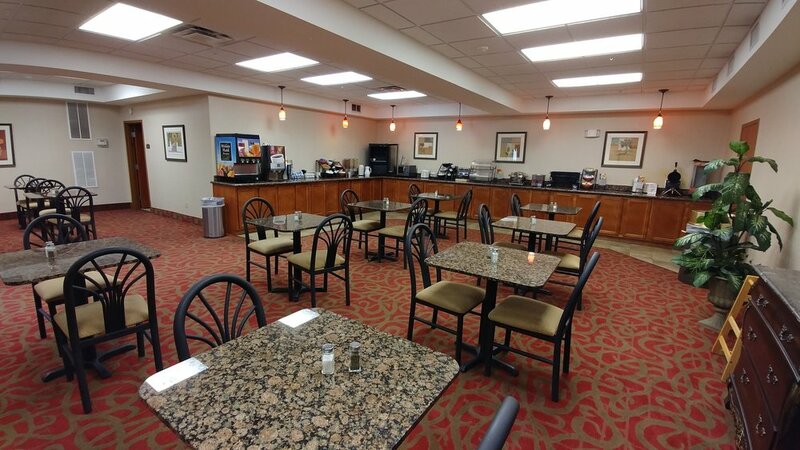 The Best Western Plus Midwest City Inn & Suites is convenient to I-40, Tinker Air Force Base, and a host of stores and restaurants. We stayed here again because of its good location and our enjoyable previous experience. As our earlier visits, this one was excellent, too. 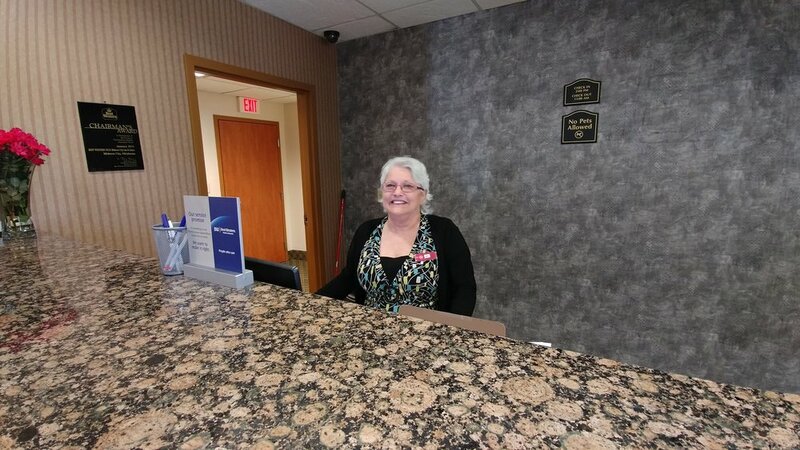 All the staff is exceptionally friendly and made us feel right at home. Linda went out of her way to ensure we had a good stay. Our king suite was large, allowing nine of our family (also in the area) to come together for a nice visit in our room. I was able to work comfortably at the desk, easy access to power outlets and good lighting. We slept comfortably as usual here, though the pillows this time were a bit lumpy. I didn't bother to get new ones from the desk. And all the beds in the hotel are being replaced this year. I asked about a couple of issues. They need to get Best Western to approve changes for this...rules apparently created by corporate staff who don't actually stay in their hotels. I hadn't noticed this elsewhere (or here at our last visit), so it may be something new. The TP roll is now placed way out of reach. Not being 8' tall, I solved this by simply setting the roll on the counter near the toilet. There is no towel rack next to the shower, so that was a bit awkward. And the soap holder is placed perfectly for whacking an elbow. I wish they would put a nice flat corner shelf in all of their Plus showers. But these were lesser issues compared to the overall room comfort. This hotel has a very nice breakfast room. 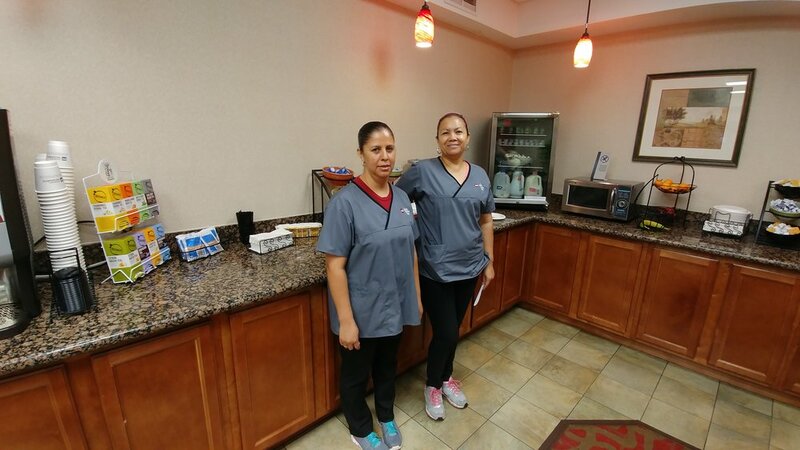 The friendly breakfast staff, Ariceli and Nancy, were attentive to ensuring everything was neat and clean. 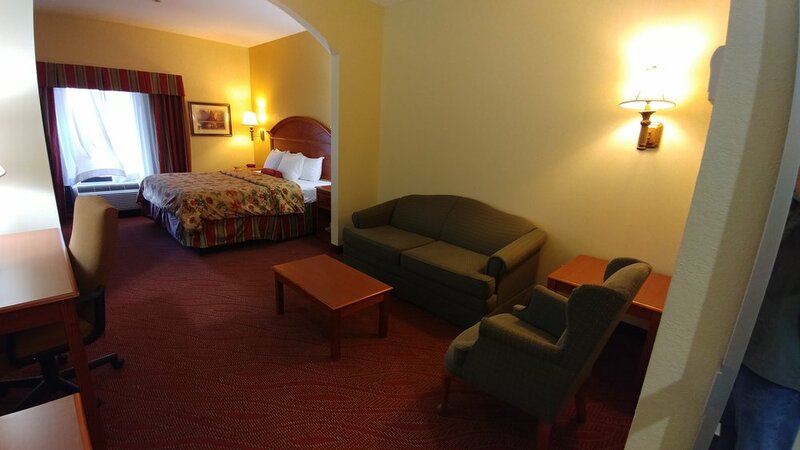 This hotel is located at one end of a very large shopping area that includes a large variety of restaurants, a Target, a Lowe's home improvement, and many other stores which was handy for obtaining last minute supplies for our family reunion. "On The Border Mexican Grill & Cantina" where, in addition to great food and wonderful homemade tortillas, they are one of the rare Mexican restaurants that knows how to do sopapillas right. "Old Chicago" gave us some of the best pizza I've had anywhere. I especially loved their take on a Hawaiian pizza. Canadian bacon, pineapple, red peppers, fresh green onions... but I think it was their sweet Thai chili tomato sauce that made it special. We stayed here twice, going out west and again on our return. Our rooms were very comfortable, clean, and uncrowded. Best Western hotels, including this one, have comfortable beds...obviously the key issue in a hotel. "Plus" hotels like this one add to the bed comfort by being "three sheeted." I really appreciate the side tables on each side of the king bed. Happily there is an accessible wall power outlet on one side. That is adequate though I prefer the nice Best Western side table lamps that have a power outlet in their base similar to the desk lamps. For me easily accessible bed side power access is important because I can read from bed using my Android mobile phone in Kindle mode and set it on the side table before falling asleep (well...sometimes) and it's still charged in the morning. The rooms have a comfortable and adjustable office chair with a work desk that has plenty of work space. There is a welcome power outlet in the desk lamp plus a wall power outlet installed above the desk for easy access. There is an Ethernet wall jack (Ethernet cables are available at the front desk) along with broadband Wi-Fi. Restroom: it is always a relief to discover that the room has more than the normal limited counter space. Happily also, at this hotel the counters are at a height for average humans (I have oft wondered why so many hotels have counter space designed for people who are 6'4"). Also, unlike some hotels, the restroom here does not have a sink counter that protrudes into your gut as you brush your teeth. I was also pleased to note that this hotel has very good water pressure. I like the bowed-out shower curtain rod used in all Best Western Plus hotels (and most others nowadays) to provide more elbow room while showering. Some time back we bought the same model of shower rod for our home. I also appreciated this hotel installing the TP dispenser where a human can reach it. I am ever surprised at the number of hotels that place these where one must perform a contortionist act to reach it. Not at this Best Western. In addition to the usual room amenities like a coffee machine and iron, the rooms here have a microwave and refrigerator. Street access to the hotel is a little odd. Look carefully for a street next to an Interstate entrance, cross the parking lot for another hotel and pull into parking for this hotel. Coming from I-40 West it is impossible during rush hour to make the right turn and cross lanes to pull into the access street for this hotel. It is safer to move on until you find a safe way to move to the left lane and then do a U-turn. We very much enjoyed our stay at the Best Western Plus Midwest City Inn & Suites. The cost is reasonable, the location convenient, and the hotel offers a relaxing and restful stay. Just the way we like it.